2015 was the first full year of operations of the DHF Pre-K through 12 Initiative which is part of The Dee Howard Foundation Fund at the San Antonio Area Foundation. Award of grant to Alamo Academies-Aerospace Academy. Award of grant to and collaboration with The DoSeum to help develop their aviation/aerospace program. Provided an aviation exhibit to Northeast ISD Career Day. DHF joined with Hallmark University and SASTEMIC as Program Partners to organize a one week aviation summer camp for high school students which was held the week of 22-16 June 2015 at the Hallmark campus at San Antonio International Airport, there was no charge to the students to attend. 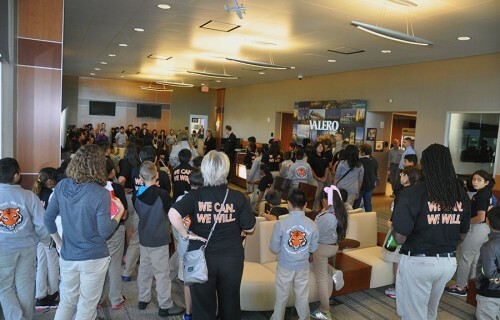 On 27 October 2015, DHF joined with the Partnership for Corporate Aviation Training, Valero and other industry partners in organizing a one day aviation/aerospace career day at San Antonio International Airport for approximately 100+ middle school students from KIPP: Poder Academy The photo at the top of this report is of the students as they were arriving at the Valero hangar for the day’s activities. DHF has begun a dialogue to collaborate with Harlandale ISD and Edgewood ISD.As a first step in that collaboration four middle school students and one adult representative from each school district will attend the San Antonio Aviation and Aerospace Hall of Fame Inaugural Dinner on 31 March 2016. Net proceeds from the Hall of Fame will be dedicated to the DHF Pre-K thru 12 Initiative. Registration information and other event details are available on the Hall of Fame web page. Natasha L. Wilkerson, STEM Project Director for Communities in Schools of San Antonio, joined the DHF Education Advisory Council. 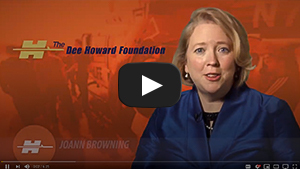 * Prior to the establishment of DHF, Dee’s children established the Dee Howard Fellowship in Mechanical Engineering at UTSA. In collaboration with and support of our community and industry partners, our goal for 2016 is to double the number of students we reached in 2015, and continue to nurture our innovators of the future. The Dee Howard Foundation provides information to individuals who might not otherwise have access. On occasion, we meet with those in need of insight into aviation and aerospace career fields by way of our experience and contacts. We are highly motivated and serve an educational role, raising the awareness of the extensive education and industry resources available.